It has long been a common practice to use metal nets as sculpture structures to be filled with plaster or similar materials. My figures however, were made in light of completely unprecedented idea. Using the unique representational potential of metal nets, I took advantage of their transparency compounded with their own shadows to create these figures. Metal net transparency as well as their own shadows is the original idea employed to create these figures. The final result is transparent figures inside which are visible from every angel. At the end of the day, the inside forms in conjunction with the outside forms create the final figure together. These figures are on one hand the continuation of my transparent paintings and on the other hand are the extension of my paper works both of which were a major part of my last ten-year experiences. During those times I was deeply involved with the idea of transparency which led to several experiences of working with a variety of media and materials including metal nets from which I made a human head of. Since then, the idea has overwhelmed me which finally led to express myself through these figures. To this end, I focused on human face. For human face is a tremendously complicated icon it has got the potential to be viewed to its different features from a new perspective. Light, going through the mesh, forms shadows on canvas which is part of the whole image and completes the whole work. In fact, the shadow of a three-dimensional sculpture reflected on a two dimensional level. The combination of both of these two and three-dimensional features forms the final result which enjoys completely a different and novel visual impression. Thanks to this idea, the sculpture mixing up with its shadow creates a unique work consisting of both the shadow and the sculpture itself. This has never been experienced in representational arts before. Cubist artists however in a somehow similar approach depicted pictures from different angles. Yet, the important point made my job distinct from cubists is that cubist pictures, - solely their drawings and paintings, but not their collages etc. – as a whole are on a two-dimensional level, while my figures are made of two elements: a three-dimensional sculpture and a two-dimensional shadow. The visual experience of these two pictures is completely different. The observer can focus on the sculpture, its shadow or both. Each choice has its own effect on the observer. The effect of the shadow along with what is seen in the sculpture itself creates new grounds to new visual understating. This can be expressional in a great deal. Comparing to the transparent reticulated shape, drawing-like lines of shadows are more apparent and more familiar to the viewer’s eyes. On the first sight however, it seems the shadow holds a more thinking and inner characteristics, while the sculpture itself owns a more outer and free character; as if a familiar issue turns into an unfamiliar one through a dialectical process and vice versa. Facing sensationally with the material it is an outstanding feature of these sculptures. Having thin and fine reticulated texture, mesh is on the edge of visibility and invisibility; as if something impossible enters into the possible world. For instance, a transparent surface with its positive and negative forms can depict human face and creates some instability. The face is real and can be a certain or uncertain one. 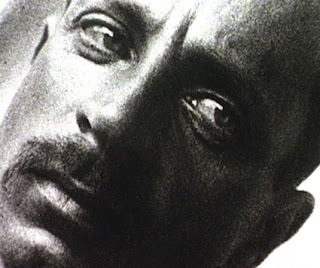 The point is that we are accustomed to see human face as something solid. Seeing this hollow transparent face, our mind involved in the fact that how this face has been made. The viewer’s mind starts to repeat its positive and negative forms and feels elongated. This reveals mind’s involvement with the image and the process of its creation. This is quit a new experience to the viewer, as if the emptiness before his/her eyes shaped into a tangible human face while its behind is also visible and at the same time a sense of lightness experienced by the viewer. By spinning light sources beamed on mesh shapes, sometimes we see pictures which are not exactly like human face but this also is attractive to us because we know shadows so unlike the shape is the reflection of the shape itself. This unlikeness is not something undesirable, but is considered as a different experience from a new perspective. If mounted on some fixed place, the sculptures react to the lights of different times of days and nights as well as different seasons. The figures react completely differently in the artificial electric lights comparing to natural light. The shadows are less apparent in the inner spaces and under indirect natural light. In such circumstances what is more visible is the net shape, but a viewer who saw it with its shape is probably expecting any unexpected event. Light is the “unexpected”. Exposing under the more changing and intense natural outdoor light, more variant pictures produced subject to different daylights. Moving the light source beamed on the sculptures, the reflected shadows animated in a different way and depict unique visual experiences. With the floating light, the resultant shadows start to change subject to the velocity of moving light source. This leads to different proportions of shapes with new forms, as if the sculpture turns its head. If the light source crossed the symmetry axis, the image will suddenly change, which can best be seen through the reflection of the shadows. Viewers can participate in the art product process with regulate and control the lights to achieve the personal picture in the shadows. The game would let the viewer to make her/his personal imagination throw the process, which make closer contact to the composition.
. . . صداي باران و صداي ناقوس‌ها به زمان تشخص مي‌بخشند: الگويي مي‌سازند، الگوي روز يكشنبه را. اگر يادت نباشد: به خود مي‌گويي بايد يكشنبه باشد. اينجوري است كه در خبابان ساكتِ من صدا ميكنند. اما در اين گوشۀ اشرافي قديمي كه امروز صبح در آن قدم زدم خيلي يكشنبه بود. هتل‌هاي قديمي بسته در فاوبورگ سنت-گرِماين با پشت دريهاي سفيد-خاكستري‌شان، با باغچه ها و حياط هاي باسليقه‌‌شان، درهاي آهني قفل شده، درهاي سنگين چفت شده. برخي از آنها خيلي مغرورانه، تشريفاتي و دور از دسترس بودند. آنها بايد از تبارِ تاليرانها، لاروشفوكوها باشند. بعد رسيدم به خياباني به همان ساكتي با خانه هاي كوچكتر، نه با سبكي خيلي برجسته، و همه مسكوني. يكي از دروازه ها نيم باز بود؛ خدمتكاري كه روزش را شروع كرده بود برگشت و با دقت و متفكرانه مرا برانداز كرد. به نظرم رسيد كه فقط تفاوتي كوچك در الگو لازم بود تا مرا بشناسد و يك گام به عقب بردارد تا در را باز كند. چون ممكن بود خانم پيري كه آن تو زندگي ميكند، يك مادر بزرگ، ممكن بود كه نوۀ موردعلاقه‌اش حتي صبح به اين زودي به ديدنش بيايد. با لبخندي، كمي مهربانانه، خانم خدمتكار آشنا به ايفاي وظيفه ميپردازد، آرام برميگردد و راه را از درون اتاق‌هاي با مبلمان ملافه گرفته نشان ميدهد، با اشتياقي ظريف و اضطراب، به خاطر آنكه جلوي من راه ميرود. غريبه‌اي كه به اين شكل مي‌گذرد چيزي نخواهد فهميد؛ اما من حضور همۀ چيزهاي مشترك را حس ميكنم: نگاه خيرۀ پرتره ها، شمارش موزيكال ساعت‌ها و خرسندي آينه‌ها را كه روشني اين گرگ و ميش را در پاكي‌شان ذخيره ميكنند. در لحظه‌اي من سالنهاي پر از نور را باز ميشناسم، و اتاقي را كه تاريكتر است، چون نقره‌هاي خانواده آن پشت همۀ نور را جذب كرده‌اند. و همۀ اين وقار بر من فرو خواهد باريد، و مرا آماده خواهد كرد تا به ديدار بانو با لباس بنفش- سفيدش بروم، لباسي كه كسي نميتواند رنگش را به ذهن بسپارد، چون كاملاً بخشي از وجودش شده است. من در خيابان ساكت قدم ميزدم و كاملا غرق در خيالاتم بودم كه سرويس نقرۀ تقريباً قديمي خيلي فشنگي را توي ويترين يك قنادي ديدم. پارچي با گلهاي برجستۀ كمي پژمردۀ نقره روي سرپوشش، و انعكاس فريبندۀ نور روي خميدگي لبه‌ها. حال باورش سخت است كه اين همان راهي است كه تو را به سالن پاييزي ميبرد. اما سرانجام من به بازار روشن نقاشي‌هاي رنگارنگ وارد شدم، كه همۀ كشش آنها نيز نتوانست طلسم خيال مرا باطل كند. بانوي پير حي و حاضر بود، و من حس كردم چقدر بايد شأن خود را پايين آورده باشد تا بيايد و اين نقاشيها را نگاه كند، و نگران از اينكه هيچ ندارم تا به او بگويم، اتاقي را يافتم با نقاشيهاي برت موريسوت (زن برادر مانه) و ديواري با كارهاي اِوا گونزالس (شاگرد مانه). براي بانوي پير درك سزان مقدور نيست؛ اما نزد ما او ارجمند، تكان‌دهنده و مهم است. او نيز (مثل) گويا ديوارهاي استوديوش در آيكس را با فانتزيهاي خود نقش كرده بود. (چند عكس از آنها را دروئه گرفته كه اينجا نمايش داده ميشوند). همۀ حرفهاي يكشنبه‌ام براي تو . . .
آب زير پل‌‌هاي زاينده رود در اصفهان جريان دارد، اما هنوز آن را نديده‌ام. آخرين باري كه پارسال اصفهان رفتم رودخانه خشك بود. فعلا كه آب در جريان است تا زماني كه دوباره قطع شود و دوباره داد همه دربيايد. مردم با دف و دايره به استقبال آب رفتند و عكس‌هاي آن را همه ديده‌ايم. شادي هم دارد، چرا كه نه؟ مگر نه اينكه رودخانه روح آن شهر كرانه‌ي كوير است و بي آن از اصفهان چيزي باقي نمي‌ماند؟ برخي چيزها آنقدر به آدم نزديكند كه وجودشان را حس نمي‌كني، تا وقتي كه نباشند، آن‌‌وقت هم نبودشان فقط در خاطره‌ي آدمي است كه مي‌چرخد. هيچ چيز چاره‌ناپذيرتر از رنج فقدان نيست. رودخانه و پل‌هاي آن يكي از تم‌هاي اصلي نقاشي من بوده است. اين اواخر يك نقاشي كشيدم كه حسم را نسبت به خشك‌شدن آب و جفايي كه بر رودخانه روا داشته‌ايم بيان كردم، بدك از آب درنيامد، اما گوياي همه چيز نيست. نقاشي‌هاي زيادي از زاينده‌رود كشيده‌ام، و هر بار بازمي‌گردم تا باز هم بكشم. من روزها و شب‌ها كنار آن آب گذرانده‌ام و بخشي از بهترين خاطرات عمرم مربوط به اين آب مي‌شود، گويي كه روخانه روح زمين باشد، و انگار كه رشته‌ي رگ‌هاي باز زمين است كه جريان يافته مثل خون در رگ، و مثل آب در آوند گياه. انگار كه زمين يك گياه يا موجود بزرگ باشد و اين آب در رگهاي آن جريان داشته باشد، روان و زندگي‌بخش. كودكان همدوره‌ي من، هر كه نزديك رودخانه زيسته، آن را نقاشي مي‌كردند، و شايد همان را هم بيشتر بلد نبودند. چند كوه در دوردست، و رودخانه‌اي كه از ميان آن‌ها به سوي جلوي نقاشي در حركت بود، با نيم‌دايره‌ي خورشيدي بر فراز آن، درست آنجا كه آب شروع مي‌شد، ميان دو كوه، و ابرهايي كه آبي بودند بر فراز. در پيش‌زمينه خانه‌اي با گل و گياه، و توي رودخانه، ماهي‌ها و مرغابي‌ها و پلي برفراز آن. اين گاه خودِ نقاشي بود و گاهي زمينه‌ي آن و كودكاني كه به سوي بيننده رو به بيرون نگاه مي‌كنند. و گاه با آدم‌هاي بزرگ پدر و مادر شايد. اين نقاشي را تقريبا همه‌ي ما كشيده‌ايم، هر كس كه در اطراف آن رود زندگي كرده است، و شايد شماي خواننده هم بارها آن را كشيده باشيد. نقاشي‌اي كه نماد زندگي و صلح در اين بوم است، و هر كس هر بار روايت خود را از آن ارائه كرده است. اين نقاشي براي آدمي كه در آن زيسته طبيعي است، چنان كه طبيعي است كسي كه در شمال زندگي كند جنگل و دريا را بكشد. من اين سنت را در نقاشي‌ام ادامه داده‌ام و اين منظره را هر بار با ديدي تازه كشيده‌ام. آخرين آن دو تابلوي رنگ و روغن بود كه همين امسال كشيدم، يكي با عنوان "رود تابستان"، و ديگري "رود زخمي". اولي تصويري از بهشتي بود كه از كودكي تا حال روح مرا تازه كرده است. و در دومي آزردگي و تاسفم را از خشكي رود بيان كردم. 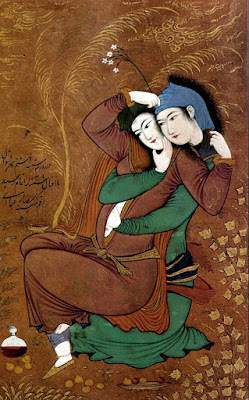 من نگران اين رودخانه‌ام. رودي كه نه تنها در بيداري كه در خواب هم با آن زيسته‌ام، مي‌خواهم دو تا از خواب‌هايم را با شما در ميان بگذارم، اين روشن خواهد كرد كه مقصودم از اين نوشته چيست. خواب مي‌ديدم كه از سرچشمه‌ي رودخانه شنا مي‌كردم، درست از سرچشمه، جايي مثل چشمه‌ ديمه كه يك رودخانه آب زلال از دل كوه بيرون مي‌زند، مثل يك كودك تازه به دنيا آمده گيج و گول است، هنوز راه رفتن هم بلد نيست و درست با همان زلالي چشمان يك كودك به دنيا چشم مي‌دوزد، و اگر برويش بخنديد برايتان لبخند مي‌زند. تا ته آن آبِ گِرد وتپل را مي‌توان ديد، علف‌هايي با رنگ سبز بهاري كه زير آب هميشه و در هر فصلي به همان رنگ سبز روشن مي‌مانند، گويي كه آن زير فصول تغيير نمي‌كنند و زير آب هميشه بهار باشد. بله درست از همين جا شروع مي‌كردم به شنا كردن، شنا اما در زير آب بود، ريگ‌هاي كف رودخانه اينجا مثل جواهر مي درخشند، ريگ‌ها ساييده نشده‌اند، درشت و خشن هستند، مثل الماس تراش‌نخورده، اما هر يك به رنگي و در مجموع فضايي بازيگوشانه ايجاد مي‌كنند، با تلالو نور خورشيد كه بر آن‌ها مي‌درخشد هر وجه‌شان رنگي ديگر را منعكس مي‌كند. ماهي‌ها، قزل‌آلاها و كپورها دسته‌دسته از كنارم مي‌گذرند و من به دنياي زير آب چشم مي‌دوزم، و خوشم. اما قرار بر آن است كه بروم، همراه با جريان آب زير آب شنا مي‌كنم و پيش مي‌آيم، اينجا آب رودخانه تند است و آدم را با خود مي‌برد، من هم مي‌روم، همراه با آب مي‌روم، از كنار تخته‌سنگ‌هاي عظيم مي‌گذرم، و از زير پل‌ها مي‌گذرم، و از آبشارها به پايين مي‌پرم. يك چشمم از بيرون نگاه مي‌كند و يكي از درون. نگاه مي‌كنم، دوستي همراه با من است، دوتايي شنا مي‌كنيم، نمي‌توانيم با هم حرف بزنيم و نيازي هم به آن نيست، حرفي در كار نيست، ما داريم مي‌رويم، خودِ رفتن هدف ماست. خسته نمي‌شويم، زير آب هم مي‌توانيم مثل روي آب تنفس كنيم. گاه اما روي آب مي‌آييم، از مسير باغ‌هاي بادام مي‌گذريم، و از كنار درختان سنجد كه شاخه‌هاشان سرخ است و از زير شاخه‌هاي بيدهاي مجنون كه سر بر آب مي‌سايند. و از كنار بيشه‌هاي كبوده‌ها كه از اينجا بلندتر از هميشه ديده مي‌شوند. بالا را كه نگاه كني آسمان آبيِ آبي و ابرهاي سپيدِ سپيد پشت شاخه‌ها ديده مي‌شوند. هيچ لاجوردي نمي‌تواند از اين آبي‌تر باشد، و هيچ سپيدي سپيدتر از سپيدي اين ابرها نيست. اما ته آب، اينجا ريگ‌ها گردند، گرد شده‌اند، تا اينجا آمده‌اند، با ميليون‌ها ميليون برخورد بر هم غلطيده‌اند و ماسه‌ها آنها را ساييده‌اند و آب برقشان انداخته است. روي آن‌ها كه درشت‌ترند و كمتر تكان مي‌خورند را لايه‌ي نازكي از خزه گرفته، آن طرف قلوه‌سنگي كه طرف آب است، رو به بالا و نور مي‌خورد و الان زير پاي ماست. و روي سنگ‌هاي گرد بزرگ را قشر ضخيمي از خزه پوشانده، و اگر آن را برگرداني كمي آب را گل‌آلود مي‌كند، گلي كه مثل خونابه‌اي همراه با آب مي‌رود، درست انگار كه زخمي به رود زده باشي. ما سعي مي‌كنيم به چيزي دست نزنيم. كنار آب پونه‌ها با برگ‌هاي سبز نقره‌اي و گلپونه‌هاي بنفشِ روشن ريزريز رودخانه را گلباران مي‌كنند. عطرشان زير آفتاب داغ در مي‌آيد و آبي آسمان را معطر مي‌كند، و روي رود پخش مي‌شود و آب را معطر مي‌كند. عطر پونه‌‌ها خنك است، درست مثل آب رودخانه كه خنك است. توي سرچشمه آب،‌ آبِ برف است. تا اينجا كه برسد گرم مي‌شود. خوشبختانه توي خواب يادم به اين موضوع نيست كه آب توي چشمه‌ي ديمه نزديك صفر درجه است. وگرنه همه‌چيز بهم مي‌ريخت و خوابي در كار نبود. ما از چم‌هاي رودخانه مي‌گذريم، بچه‌هاي همسن منم يك شوخي داشتند، انگشت اشاره‌شان را خم مي‌كردند و مي‌گفتند: اگه گفتي اين چيه؟ جوايش اين بود كه اين يك ماهي است كه توي پيچ رودخانه گرفته‌‌اند. بدن‌هاي ما هم توي چم خميده بود. چمْ نام پيچ رودخانه است. رودخانه اينجا بالغ شده و در هر چمي يك روستا مي‌زايد. خيلي از روستاها نامشان با چم شروع مي‌شود. و چه نام‌هايي: چم آسمان، چم چنگ، چم‌ آلي ... فكر مي‌كنم كسي كه در جايي بدنيا بيايد كه نامش چم‌آسمان است بايد آدم خوشبختي باشد. اينجا پرنده‌ها هم خوشبختند، حتي كلاغ‌ها هم خوشبختند، مثل اين‌يكي كه از بلندترين شاخه‌ي كبوده مي‌پرد و با قوسي آرام از بالاي سر ما آسمان را مي‌بَرد و روي شاخه‌ي درخت ديگري آنسوي رودخانه مي‌نشيند. لبخندي بر لب من مي‌نشيند. اين كلاغ بدون شك خوشبخت‌تر از كلاغ‌هاي دپرسِ شميران است كه درخت‌هايش را، گردويي را كه خودش كاشته است را، از زير پايش بريده‌‌ايم به جايش برج كاشته‌ايم. و اگر بخواهد از روي يك برج بي‌بال زدن روي ديگري بپرد بايد از روي شطي از ماشين عبور كند، و متحير است كه اين خرسنگ‌هاي جن زده‌ با دود ناخوشايندشان از كجا ظهور كرده‌اند، و كجا مي‌غلطند و به كجا مي‌روند، اما كلاغ ما خوشبخت است. زير پايش كسي است كه با لبخندي بر لب خوابش را خواهد ديد. اينجا در سير خواب فرقي با واقعيت است چون پس از روستاها به سد مي‌رسيم، اما سد پيش از آن‌ها واقع شده است. اينجا آب پهن مي‌شود و كم كم عميق و عميق‌تر و سبز و سبزتر مي‌شود، كمي نور اينجا هست، و مي‌توان يان‌چشمه‌ي خفته در زير آب را ديد. يان‌چشمه از اولين روستاهاي رودخانه بوده است. آب تا اينجا تندتر از آن بوده كه زمين باب كشت در كنارش باشد. اما يان‌چشمه زمين حاصلخيزي داشت، يان‌چشمه به زبان تركي يعني چشمه‌ي روغن. نامش گوياي حاصلخيزي آن است. يكي از آبادترين روستاهاي ايران. و اولين روستاي آباد در مسير رودخانه به سوي پايين. و چون اولين بود قرباني شد. الان زير آبِ سد خفته، به ملاقاتش مي‌رويم. گل و لاي رودخانه همطراز افق روي خانه‌هاي ده رسوب كرده است. ده توي شيب ساخته شده و نيمي از آن كاملا زير آوار يكدست رسوب ناپديد شده، نيمي ديگر بيرون از رسوب است، خط كج رسوب دهكده را بريده است. اين رسوبي است كه بايد تا دشت اصفهان همراه رودخانه مي‌رفت و جلگه‌ي اصفهان را مي‌ساخت. الان گل اينجا رسوب مي‌كند. با حسي از بلاهت و بيهودگي. رسوب اگر با سير طبيعي خود سفرش را به انتها مي‌رساند در انتها آبادان مي‌كرد، و به رستگاري مي‌رسيد. اما اينجا روي دهي هوار شده كه مردمانش گريخته‌اند. رٍس يكدستِ خيس خورده در پيش‌زمينه و در پس‌زمينه‌ با آبي مينايي آب. و ماهي‌ها، كپورهايي بزرگ، خيلي خيلي بزرگ، قد يك ببر، اين كوچه‌ايست كه در آن كودكي اسب مي‌تازانده است. الان به جاي اسب، ماهي‌ها در اين كوچه‌ها جولان مي‌دهند. و اين خانه‌ي بي سقف جايي است كه در آن مردماني عشق ورزيده‌اند. من اينجا چيزي گم كرده‌ام، چيزي است كه خيلي برايم مهم است، و به يادش نمي‌آورم، شايد چيزي از كودكي من است، از زماني كه در اين روستا به ميهماني آمده‌ام. از روزني به درون يك اتاق مي‌روم درون خانه را مي‌كاوم، تاريك است، چيزي نمي‌يابم. نگران مي‌شوم و بالا مي‌آيم، از تاريكي فرار مي‌كنم. سفر همچنان ادامه دارد، بايد بروم، اينجا ديواره‌ي سد است، ديواره‌اي كه آب را نگاه داشته و نمي‌توان از آن گذشت. فقط يك راه وجود دارد، آن‌هم رخنه‌ايست در ديواره‌ي سد كه آب را به توربين‌هاي درون سد هدايت مي‌كند، چاره‌اي نيست، اينجا جريان آب بشدت تند است. نزديك سوراخ كه بشوي تو را مي‌مكد و رفته‌اي. نزديك مي‌شويم و مي‌رويم، تندترين دور عمرم را دورِ توربين مي‌زنم از لاي پره‌ها مي‌گذرم و پس از يك دهليز، خوشبختانه بي‌آنكه آسيب ببينم از دريچه‌ي سد به بيرون پرتاب مي‌شوم، نور و آفتاب را حس مي‌كنم و همراه با جريان آب كف‌آلود با شادي بي‌اندازه‌اي كه مثل شادي آزادي است به پايين سقوط مي‌كنم. برداشت ديگري از اين صحنه را با چشمِ بيرون از خودم و از بيرون مي‌بينم، شايد هم با حركت آهسته. به دوستم مي‌گويم ساكنان اين ويلاها بايد نوعي ناشناخته از دوزيستان باشند، ببين: پله‌ها را تا ته آب ادامه داده‌اند. اين پل زمانخان است. با دو دهانه‌ي قوسي شكل بزرگ و تك‌پايه‌اي كه روي سنگي وسط رودخانه بنا شده، دو پايه‌ي سر و ته پل هم روي دو صخره قرار دارند. زماني مردي نيك آن را ساخته تا مردمان از رنج عبور از آب راحت شوند. يونسكو چندي پيش عكس آن را به عنوان نماد آرامش و ثبات ذهن منتشر كرد، به خاطر سه پايه‌ي استوار روي سنگ. ايكاش من هم ذهني با چنين ثباتي داشتم با پايه‌هايي بر صخره و سنگ. من از دهانه‌ي سمت راست مي‌روم و دوستم از دهانه‌ي سمت چپ. زير دهانه‌ي سمت راست، پس از پل گودالي عميق هست. آب مي‌جوشد و از كف سفيد است. جوانان جسور نسل پدران من از بالاي پل درون اين گودال شيرجه مي‌زدند. عمو منوچهر هم اين كار را كرده است، آب او را پيچانده و زير تخته‌سنگي گير انداخته است، آب با او بازي كرده و تا مرز غرق شدن نگاهش داشته، سپس رهايش كرده تا در پيچ بعدي رودخانه از آب بيرون بيايد. وقتي در كودكيم داستان را تعريف مي‌كند از وحشت يخ مي‌كنم. و وقتي رودخانه رهايش مي‌كند آرام مي‌گيرم، خوشحالم كه آب او را از من نگرفته، بغلش مي‌كنم. من هم در آرزويم صد بار خواستم بپرم، با قوسي بلند درون اين آب وحشي شيرجه بزنم، اما هرگز چنان جسور نبود‌م. حالا مي‌توانم در خوابم تجربه‌اش كنم. من با جريان تند آب از پيچ و گودال زير آن عبور مي‌كنم، حفره‌ي زير سنگ را مي‌بينم و به سفرم ادامه مي‌دهم. چند بار بايد اين خواب را ديده باشم؟ ده‌ بار صد‌ بار؟ آيا ممكن است؟ بله ممكن است. تم اين خواب يكسان است،‌ تنها تفاوتي در جزئيات هست. آن فرزانه‌ي يونان باستان – هراكليتوس - راست مي‌گفت،‌ هر بار پا به رودخانه‌اي ديگر مي‌گذاري، هر بار رود تازه است. توی خواب من پل سه طبقه دارد، دو طبقه بر روي آب و يكي زيرآبي. اساس ساختمان پل توي خوابم همان است كه در بيداري هست همان دهالنه‌ها، طاقي‌ها، و زيرطاقي‌ها با همان تناسب‌ها اما جزئيات خيلي متفاوتند. توي خواب من آب در هر سه طبقه جريان دارد. در هر سه طبقه. از بالاي پل جرياني از آب از درون جويي سنگي به آن سو مي‌رود. مثل جويي كه روي پل چوبي (جوبي) بوده است، روي پل و درون ديواره‌هاي آن دهليز‌هايي هست كه آب را مثل رگ‌هاي بدن يك موجود زنده از همه جا عبور مي‌دهند. من از پل عبور مي‌كنم، از كنار چشمه‌ها و چاه‌هايي كه آب از آن‌ها پايين مي‌ريزد مي‌گذرم، به درون طبقات مختلفش مي‌روم، گاه مي‌نشينم، مردمان هم هستند. مثل هميشه كه زير و روي آن پل پر از آدم است. كساني مي‌آيند و مي‌روند. من در طبقه‌ي زيرآبي پل نشسته‌ام و با دوستانم گپ مي‌زنم. اينجا قوانين جاذبه و هيدروديناميك روي آب حاكم نيستند. ستوني استوانه‌اي از آب در حركتي افقي از بالاي سر ما مي‌گذرد، از سوراخي در اين طاقي به سوراخي ديگر در طاقي مقابل مي‌رود. از يكي از ديواره‌هاي جايي كه نشسته‌ايم آب به شكل افقي دهانه‌ي يك طاقي را از سر تا پا با فشار در مي‌نوردد. و در جايي ديگر مكعبي از آب جرياني سريع به سوي زمين دارد. آب در رگ و پي پل مي‌دود. و ما نشسته‌ايم و گپ مي‌زنيم. همه چيز كاملا طبيعي است، پل هميشه چنين بوده است، و ما با آن اخت هستيم. ستوني از آب كه از چاه روي سطح پل به پايين سرازير شده، با همان قطر از دهانه‌اي ديگر پايين مي‌ريزد، بي‌آنكه شكل استوانه‌ايش را از دست بدهد. سي‌و‌سه دهانه هست كه در هر كدام چندين اتفاق مي‌افتد. نماي پل تركيبي است از آب، آجر، نور، سايه و هوا كه با تناسب‌هاي طلايي در تطابق دقيق با معماري پل در هم تنيده شده‌اند. موسيقي آب فضا را تكميل مي‌كند. مردم از ميان اين جريان‌هاي آب، از روي پله‌ها، از ميان طاقي‌ها و زيرطاقي‌ها و دهليز‌ها درگذرند. و من با دوستانم به صحبتي بي‌پايان مشغوليم، در آرامشي كامل. اين خواب را بارها و بارها مي‌بينم، هر بار با تركيب و معماري‌اي متفاوت، با نقش‌هاي متفاوت از كاشي‌هاي نيلي و آبي كه عاشقشان هستم. و با معماري‌اي متفاوت اما با همان اسلوب هوشمندانه و هماهنگ، سبك و صميمانه كه عاشقش هستم. بيدار كه مي‌شوم سرخوشم. بارها سعي كردم آن را به تصوير بكشم، كاري بي‌حاصل بود. بايد همه‌ چيز را با دقت معمارانه و با رعايت دقيق اصول پرسپكتيواز نو طراحي مي‌كردي، تا فقط يك لحظه از تجربه‌اي را كه در زمان اتفاق مي‌افتاد و از هزار زاويه هزار شكل به خود مي‌گرفت ترسيم كني، نقاشيش ابزار اين كار نبود. اين پلي بود كه از كودكي از آن عبور كرده‌ام، هر بار با شگفتي تمام. پلي كه ساعت‌ها و ساعت‌ها عبور آب را از فراز آن نگريسته‌ام. پرواز بازيگوشانه‌ي پرنده‌ها را و رشته‌هاي گيسوي سبز گياهان را. نوجوان كه بودم وقتي از پل عبور مي‌كردم دلم نمي‌خواست هرگز تمام مي‌شد. كنار اين پل است كه قرار عاشقانه مي‌گذاشتم. و وقتي نااميد و خسته و غمگين بودم پناهم مي‌داد، با پرواز يك پرنده از دهانه‌اي به آنسوي پل، با رنگ‌هاي زيباي غروبش، و با ترنم آبش. و هر گاه نااميدي‌ام به نهايت مي‌رسيد با خود مي‌گفتم حداقل اينجا جايي است كه مي‌توان خود را از بالاي آن به پايين پرت كرد تا رودخانه در سفر آخرين به مقصدت برساند. اولين باري كه از روي رود خشك از پل گذشتم، دچار احساساتي منتاقض شدم. مي‌دانستم آن طبقه‌ي زيرآبي هرگز وجود نداشته، اما نمي‌خواستم نگاهش كنم تا باور كنم. پلي بر روي رودي خشك، كه وجودش بلاهت‌آميز است و بيهوده است. مردم از كف رودخانه عبور مي‌كردند، بعضي‌ها براي خودشان فوتبال بازي مي‌كردند و من به قبرستان رؤياهايم نگاه مي‌كردم. اين چند سال دلم نخواست به اصفهان بروم. آخرين بار كه از روي پل رد شدم، پارسال رودخانه خشك بود. خجالت كشيدم كه به پايين نگاه كنم، مثل يك دزد و با سرعت از روي پل رد شدم، شرمزده و خشمگين از بلايي كه سر اين رود آورديم، از نبودش و از حماقت و حرص و طمع انساني كه تا چه حد مي‌تواند پيش برود. براي اطلاعات نمايشگاه پست قبلي را نگاه كنيد. نمايشگاه شامل نقاشي‌هاي اخير من است، كه در سبك‌هاي آبستره، و نيمه‌آبستره كار شده‌اند. تعدادي از كارهاي موجود در نمايشگاه با رنگ‌هاي دست‌ساز خودم نقاشي شده و از اين بابت كيفيت بصري كاملا متفاوتي با كارهاي معمول دارند. تم اصلي نمايشگاه در ستايش رنگ است، و استفاده از قدرت بياني آن به شكلي خالص و در ارتباط دروني با فرم. از آنجا كه من خود را نقاشي رنگ‌گرا مي‌دانم، گرايش اصلي كارم رساندن رنگ‌ها به كمال بياني‌شان است. همان اتفاقي كه در مينياتور ايراني قابل مشاهده است، و در ادامه به نقاشي امپرسيونيست‌ها، و سپس به فوويسم مي‌رسد. اشاره‌ام به مينياتور ايراني مي‌تواند كامل‌تر شود، اگر بر اين نكته تأكيد كنم كه علي‌رغم وجود چنين سنت عالي‌اي در ايران، امروز نقاشي ايراني بسيار با ارزش‌هاي آن فاصله گرفته است. تلاش من در كارهاي اخير زنده كردن اين سنت ارزشمند است، نه فقط بر اساس سنت، بلكه با تكيه بر ارزش‌هاي هنر مدرن. دو خط اصلي در كارهاي اخير من دنبال شده است. يكي طبيعت است كه در كارهاي نيمه‌-آبستره اساس كار را تشكيل مي‌دهد. و ديگري انتزاع كامل رنگ و فرم در كارهاي آبستره. آنچه برايم بسيار قابل تأمل است فاصله‌ايست كه دنياي امروز با رنگ گرفته است. رنگ، علي‌رغم آنكه بيش از هر زمان ديگر در تاريخ در زندگي ما رخنه كرده، اما از يكي از كاركرد‌هاي اصلي خود دور شده است. توانايي زندگي بخش و قابليت انتقال انرژي دروني‌اش و تعميم آن به زندگي اجتماعي و فردي. رنگ كه مي‌تواند تا حد يك نشانه تقليل يابد، در زندگي امروز ما هر چه بيشتر استفاده مي‌شود، از محتواي خود دورتر و دورتر مي‌شود. سعي من بر آن بوده تا در كارهاي اخير رنگ را چنان در يك تركيب بكار برم كه مثل استفاده از يك واژه در شعر تازگي و طراوت خود را دوباره باز يابد. 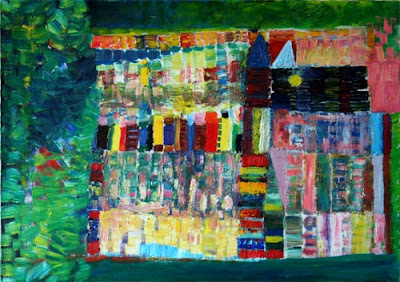 The show is contain my recent paintings, worked in abstract and semi-abstract style. Some of this collection has worked by my hand-made colors, which make different quality and features. 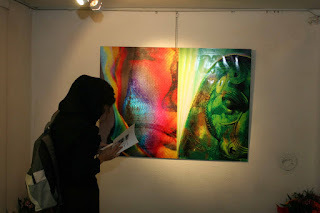 The main theme of exhibition is praise the color, according to drive it in pure look, related with inner form. 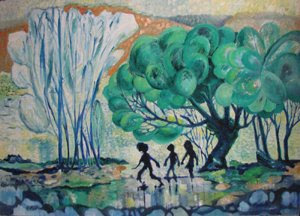 Hence I mention myself as a Colorist painter, reaching the finesse expressive of colors is the main goal of the works. 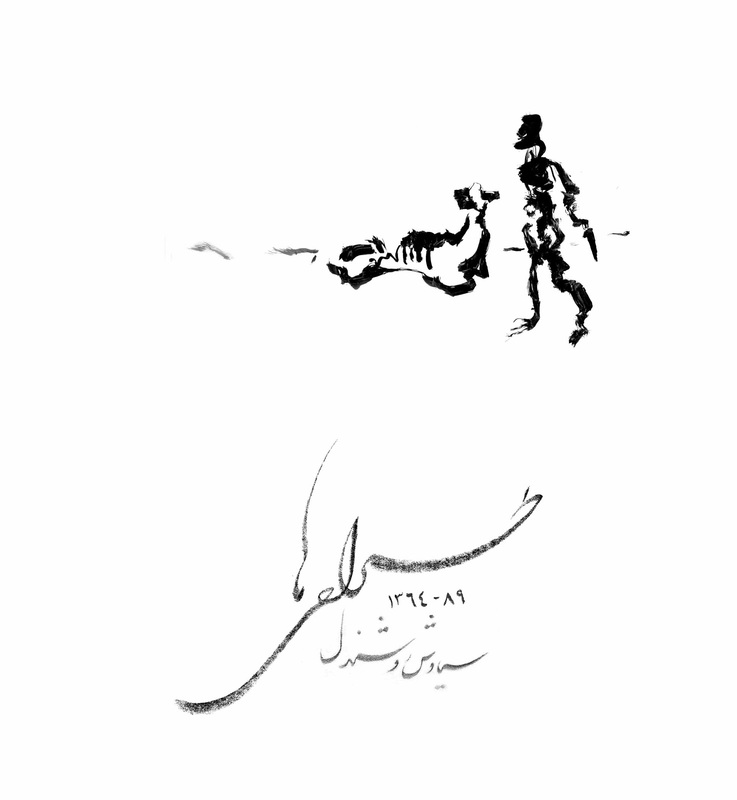 The happening could be reveal in Iranian Miniatures; thereafter from impressionists to Fauvism. It could be clearer if I complete my saying about Iranian Miniatures by emphasis on: we are far from these values, In spite of having this marvelous tradition in Iran. My concern is re-living this valuable tradition in my recent works, not only based on tradition, but also depends on Modern art. 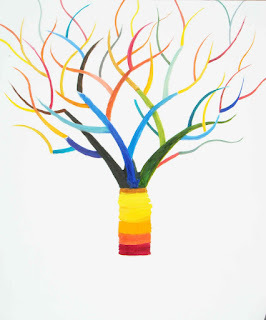 Two main lines is followed in my recent works: one is nature which is the base of semi-abstract works, and the other is absolute abstraction of color and form in abstract paintings. Despite of the fact that occupation of our life by the colors is incomparable, the world is going more and more far from one of the main functions of colors: the ability of making life and transition of its inner energy to generalization of it to social and private life. With every other period in the whole history of human being, this is so important to me. I have tried to use the color in my composition like the usage of a term in a poem, to reach coincide value in form and color. It could be perhaps try the lasting painters dream to reach a form, simultaneously coincidence the color. An aspiration which could be sweet like to reach the goal, which is sometimes unreachable, yet there would be joy and delight in pace. NO 48.19TH ST.JAHAN-ARA ST.JALAL AL AHMAD AVE.
کتاب ماتیس در باب هنر بالاخره منتشر شد. کتاب مجموعه کارهای نوشتاری و گفتاری هانری ماتیس است. پیش از این یکی از مقالات این کتاب را ترجمه کرده بودم و در همین وبلاگ و سایت کارگاه ارائه کرده بودم. سایتهای بسیاری به آن لینک داده بودند. 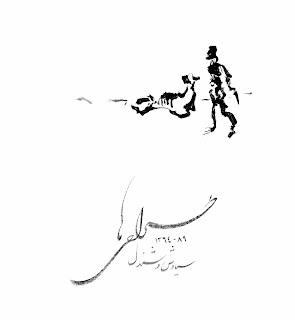 نام مقاله: "نامه به یک دوست بود". من مقاله را با همین نام از روی اینترنت گرفته بودم. نام مقاله در کتاب: "نامه به هنری کلیفورد" است. در واقع همین استقبال بیننده ها بود که ترغیبم کرد تا منبع مقاله را پیدا کنم که همین کتاب است و دست به ترجمه آن بزنم. امیدوارم که این کتاب برای علاقمندان مفید واقع شود. نشر رخداد نو/قطع رقعی/ 463 صفحه/ قیمت 11000 تومان. در ضمن نقاشي مورد نظر دوچرخه‌ايست كه در دو پست قبلي در همين بلاگ ديده مي‌شود. 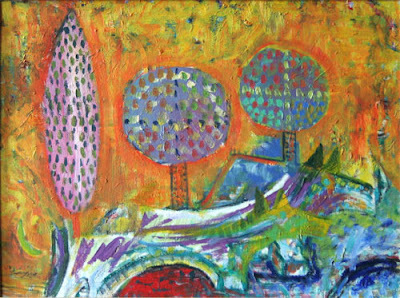 This is my last painting, i`m trying to put more works on the blog. i worked this picture after some etudes beside the zayande-rood river. متاسفانه من تاريخ دقيق ادامه‌ي نمايشگاه را نمي‌دانم. طبق معمول روي سايت اكسپو هم اين تاريخ‌ها را پيدا نكردم. به هر حال اين روزها كه هست، اگر اطلاع دقيق پيدا كردم خواهم گفت. آدرس و مشخصات ديگر را از سايت خود اكسپو مي‌توانيد دريافت كنيد. نمايشگاه‌هاي نقاشي هر كدام شخصيت خاص خود را دارند. آداب نمايشگاه اين جوري است كه روز شروع دوستان را دعوت مي‌كنيم، به صرف چاي و شيريني و شربت، در ساعت 4 عصر معمولا-يا هر ساعت ديگري كه نمايشگاه تعيين كند- و خب كم‌كم دوستان مي‌آيند و گل مي‌آرند، بعضي، كه البته خودشان گل هستند و نيازي هم هست، بعد كارها را نگاه مي‌كنند، و كمي مثل يك پارتي كوچولوست كه دوستاني كه در اين شلوغي روزگار سال به سال همديگر را نمي‌بينند ممكن است آن‌جا ببينند. خلاصه درباب كارها رسم است كه حرفي زده شود، و من از آن‌ها كه سكوت مي‌كنند مي‌پرسم، خب كدام كار را دوست داشتيد؟ و او هم مي‌گويد اين يكي يا آن يكي. بعد دوري مي‌زنند، بچه‌ها، و معمولا نمايشگاه براي چرخ زدن جاي مناسبي نيست، آدم را خسته مي‌كند، كمي مي‌نشينند و بعد هم مي‌روند. گاهي اگر كارها باب ميل دوستانم باشند مي‌خرند، و گرنه كه خب آرزوي موفقيت مي‌كنند و مي‌روند. اين از دوستان من. گالري هم طبعا به سهم خود آدم‌هايي را دعوت مي‌كند و اين‌ بار از حدود 300 كارتي كه داده بودم و فرستادند، روز اول سه چهار نفر از طرف گالري آمدند. و روزهاي ديگر هم كه پرنده پر نمي‌زد. خيلي جالب است كه كسي علاقه‌اي به ديدن كارها نشان نمي‌دهد. خب اين نگران كننده است، اگر نمي‌خرند حداقل بيايند و نگاه كنند. به خانم مسئول گالري مي‌گويم پس چرا اين‌جوريست؟ مي‌گويد: احتمالا مردم از كار ديجيتال خوششان نمي‌آيد. مي‌گويم خب وقتي كار را نديده‌اند از كجا مي‌دانند كه خوششان مي‌آيد يا نه، مشكل اين است كه اصلا كسي براي بازديد نمي‌آيد؛ حالا شما طلا ريخته باشيد و بگوييد مجاني بيايند ببرند. شوخي نمي‌كنم در طول 10 روز به جز دوستان خودم روزانه دو سه نفر بيشتر بازديد كننده نداشتيم. گالري افرند هم گالري ناشناخته نيست، جزء گالري‌هاي قديمي و معتبر تهران است، خب به اين ترتيب كاري هم به فروش نمي‌رسد و فقط خرج و مخارج آماده كردن نمايشگاه به گرده‌ي هنرمند تحميل مي‌شود. خب نان ديجيتالي را هم كه نمي‌شود به شكم بست و بايد فكر نان كرد. بعد موضوع تبلغات پيش مي‌آيد. راستش در اين فاصله خبرنگار محترمي از روزنامه‌ي همشهري آمد و مصاحبه‌اي انجام داد كه هنوز چاپ نكرده، دوستان روزنامه‌نگار مي‌گويند مسئولين تحريريه به شدت به اين نوع كار (منظور كار بسيار بدي است كه من انجام داده‌ام، نقاشي كرده‌ام) حساس هستند، در كلاس‌هاي روزنامه‌نگاري مي‌گويند بپائيد كه آگهي را به جاي خبر به شما نچپانند. اصطلاحش هم هست رپرتاژ آگهي. به زبان آدميزاد يعني اگر پول بدهيد خبر نمايشگاه چاپ مي‌شود و گرنه خير. كسي نيست به اين علما و نوابغ روزنامه‌نگاري ايران حالي كند كه دوستان، خبر هم كه از زمانش گذشت تبديل به عنصر نامطلوبي بدتر از جزغاله دنبه به نام خبر سوخته مي‌شود كه به درد عمه‌ي صاحب خبر هم نمي‌خورد. اما خب حكايت نظام مقدس سرمايه‌داري است و تابوهاي زيرپا نگذاشتني‌اش. از سيماي شبكه‌ي 4 هم قرار گذاشتند كه بيايند و گزارش تهيه كنند كه نيامدند. از همه‌ خنده‌دارتر مسئول صفحه‌ي هنري يكي از روزنامه‌هاي بسيار معتبر بود كه دوستي مي‌شناخت و گفته بود مي‌آيد. نيامد. سراغش را گرفتم، دوستم مي‌گفت رفت و آمد مشكل است، روزنامه هم پول آژانس را نمي‌دهد، تو بيا. گفتم آخه عزيز من نمايشگاه جاي ديگري است،‌ فلاني نمي‌خواهد حداقل كارها را ببيند و بعد چيزي بنويسد؟ گفت نه نيازي نيست، بيشتر اوقات مردم‌اند كه به روزنامه مراجعه مي‌كنند. اصلا خودت يك مصاحبه با خودت بكن چاپ مي‌كنيم. اين ديگر شاهكار بود. خبرنگار ديده بوديم، نديده بوديم كه خود صاحب خبر، خبرآور شود. اي بي‌خبر "مكوش" كه صاحب خبر شوي، خبر خودش ميايه. پس من و گالري شروع مي‌كنيم همديگر را متهم كردن،‌ مي‌گويم من كه كار خودم را انجام داده‌ام؛ بخش فروش را شما بايد اداره كنيد. او هم معترض مي‌شود كه چرا من پيكاسو نيستم. مي‌گويم پس چطور بايد اين كارها را فروخت؟ مي‌گويد بايد شانس داشت. اما من معتقد به بخت و اقبال نيستم. كار من هم در نهايت كالاست و فكر نمي‌كنم كريستي و ساتبي هم فروش كالاي‌شان را به بخت و اقبال واگذار كنند. اما من استثنا نيستم. اين وضعيتي است كه براي همه‌ي هنر ايران پيش آمده، يك جور رخوت است، يا شايد از آن بدتر جمود نعشي است كه درماني هم ندارد. مگر وضعيت خواننده‌هاي كتاب بهتر است؟ تيراژ كتابي كه چند سال وقت براي فروش هزار نسخه‌اش لازم دارد شاخص خوبي براي علاقه به فرهنگ و هنر است. هزار نسخه را به تعداد كتاب‌فروشي ها تقسيم كني روزي نصفه كتاب هم فروش نمي‌رود كه كتاب يك‌ساله تمام شود. البته الان كه ناشر‌ها كتاب خودشان را در كتاب‌فروشي‌هاي خودشان بيشتر مي‌فروشند. از توليد به مصرف است. وضعيت فيلم، چطور؟ چند فيلم بدرد بخور در اين سال‌‌هاي اخير ساخته شده؟ و تئاتر كه دادش را همه‌ي اهل تئاتر زده‌اند. موسيقي‌ ما كجاست؟ هنوز كه هنوز است اهل موسيقي در حسرت يك سالن با كيفيت صوتي مناسب هستند كه بشود يك اجراي جدي را به شكل آبرومندانه در آن برگزار كرد. از هنر ضاله رقص كه پيش‌مرگ بقيه شد. و راستي معماري، معماري والامقام معاصر كه دوست معمارم به اين شيوه توصيف‌اش مي‌كرد: "فحشاي معماري"؛ نمي‌دانم كسي دركش مي‌كند يا نه اما خوب گفتي و همين است. و بي‌شك مردم هم در اين ميان حقي دارند. وقتي ديوارهاي گالري‌ها، موزه‌ها و نمايشگاه‌هاي رسمي را كارهاي نقاشان بسيار محترمي پر كرده كه هيچ يك از خطوط قرمز حاكميت را زير پا نمي‌گذارند و راضي‌اند به همان كارهاي بي‌ بو و بي‌خاصيتي كه هزاربار خورده و بالا آورده شده‌اند؛ و درست است، وقتي همه با دقت تمام در حال خودسانسوري هستيم كه مبادا خاطر آيند و روند و پرند و چرند آزرده نشود، شايد اين رفتار بهتري باشد كه آدم‌ها قيد رفتن به نمايشگاه را بزنند و بنشينند همان گوشه‌ي خودشان كه گوشه‌ي امن‌تري هم هست حتما براي آرامش روح و روان. جمعه 10 آبان نمايشگاه من در گالري افرند برگزار مي‌شود. كارهاي به نمايش گذاشته 7 عدد است كه در ابعاد بزرگ پرينت شده. تم كارها تلفيقي از عكس‌هاي مختلف است كه هر يك براي خود تاريخچه‌اي دارد. در همه‌ي كارها تصاويري از تخت‌جمشيد پايه‌ي اصلي كار است. قصد من آن بود كه بخشي از تصاويري كه بارها ديده شده را با فاصله‌گذاري تازه كنم، و كاري كنم كه اين تصاوير با نگاهي نو ديده شوند، و بيشتر توجه من به حسي است كه درون سر گاوهاي تخت‌جمشيد هست، حسي عميق‌، انساني، با نگاهي مهربان و محزون. آدرس گالري افرند: بزرگراه جلال آل احمد. خيابان جهان‌آرا، خيابان 19 يا جلال حسيني، بعد از تقاطع اشك شهر، پلاك 48. نمايشگاه از تاريخ جمعه 10 آبان تا سه‌شنبه 21 آبان برقرار است. ساعات كار گالري: روز گشايش، 4 تا 8 عصر و روزهاي ديگر 3 تا 7 عصر. نگارخانه پس از روز گشايش همه‌روزه غير از روزهاي تعطيل رسمي و جمعه‌ها آماده بازديد است. Opening hours: Friday, 4:00 pm- 8:00 pm. 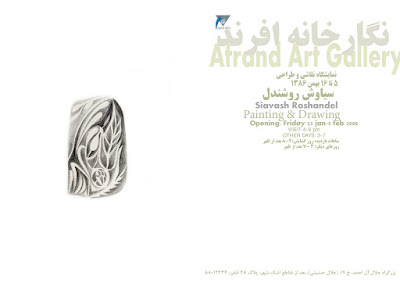 The Afrand gallery is open everyday exept official hollidays and friday. نقاشي سوررئاليستي هيچ‌گاه به پاي شعر و ادبيات آن نرسيده، همين‌طور فيلم‌هاي آن. زبان به دليل آزاد گذاردن شنونده-خواننده در تجسم موضوع بسيار موفق‌تر از تصوير است. تصويري كه ناگزير حضور عيني خود را با قدرتي كه نمي‌توان از سيطره‌ي آن رها شد بر ذهن تحميل مي‌كند. اين گل، اين پرنده‌، اين چهره وقتي تصوير شد و ديده شد، در ذهن حك شده و نمي‌توان آن را از حافظه پاك كرد. اما گل و پرنده در شعر براي هر خواننده-شنونده تصويري متفاوت و با كمالي غيرقابل وصف ايجاد مي‌كند. شور، اشتياق زندگي و تصاوير بي‌بديل شعر سوررئال در كارهايي مثل لوركا، الوار، يا نرودا قابل مقايسه با تصاوير وهم‌زده‌ي نقاش‌هاي سوررئال نيست. نقاشي دالي، يا ماكس‌ ارنست را در نظر بياوريد، حسي كه از نقاشي بيرون مي‌تراود، حسي گروتسكي، بازي روانكاوانه با ذهن، حضور روشن عقل، و نبود عنصر شاعرانه و تغزلي است. شايد موفق‌ترين تصاوير نقاشي سوررئال متعلق به رنه ماگريت باشد، مثلا "اتاق موسيقي"، يا ديگر نقاشي‌هاي او كه عناصر طبيعي در آن‌ها رنگي شاعرانه پيدا مي‌كنند. آيا براستي ساختن تصوير سوررئال در نقاشي غير ممكن است؟ آندره برتون در "سوررئاليسم چيست؟"، اشاره مي‌كند كه پيش از سوررئاليست‌ها نيز سوررئاليسم وجود داشته، و مثال‌هاي زيادي مي‌آورد، از جمله: "پيكاسو در كوبيسم سوررئاليست است." نگاهي گذرا به تاريخ نقاشي نيز اين نظر را تاييد مي‌‌كند، آيا گوگن در "مسيح-جوواني" سوررئاليست نيست؟ آيا پيتر بروگل در "سقوط ايكاروس"، كل كارهاي جوزپه آركيمبالدو تركيب‌هاي جنون‌آميز سبزيجات، گل‌ها و اشيا كه به انسان بدل مي‌شوند، آيا "تولد ونوس" بوتيچلي اثري كاملا سوررئاليستي نيست؟ آيا نمي‌توان بسياري از كارهاي نقاشي دنيا، از جمله كارهاي نائيف اقوام و ملل گوناگون را سوررئال به حساب آورد. سوررئاليسم خوانشي ديگرگون از واقعيت است، با استفاده از عناصري كه مدعي‌ است مي‌تواند به جوهره‌ي هستي دست پيدا كند. مي‌توان اين خوانش را به كل تاريخ بشر و تلاش براي فهم رازهاي آن به كمك هنر تعميم داد. اگر اين خوانش را بپذيريم نقاشي‌هاي سوررئاليست‌ها بخشي از تجربه‌ي بشري برآمده از تجربه‌ي دهشت‌آور دوره‌اي خاص-دوران پس از جنگ جهاني اول-هستند. در عين حال نزديكي تجربيات هواداران و اعضاء اين جنبش خود بخود فرايندي از شبيه‌سازي، تقليد، تاثيرات مستقيم از يكديگر را نيز در كار آن‌ها ايجاد كرده است. شباهت كارهاي ماكس ارنست، فرانسيس پيكابيا و دالي غيرقابل انكار است. اين شباهت ناگزير افرادي است كه با يك انديشه‌ي مشخص با هم كار كرده‌اند و آن را مي‌توان با شباهت ميان كار پيكاسو، براك و خوان‌گري در ابتداي كوبيسم قياس كرد. شباهتي كه درعين‌حال مانع از اصالت كار هيچ يك نمي‌شود. اما شباهت كار بسياري ديگر از نقاشان مدعي سوررئاليسم در تاريخِ پس از آن بدون پشتوانه‌هاي نظري، سياسي و اجتماعي آن چه‌قدر ترحم‌انگيز و مسخره جلوه مي‌كند، انبوه كارهايي كه انگار يك دالي ناقص‌الخلقه با اختلال فكري توليد كرده و هيچ ردپايي از آن‌چه سوررئاليست‌ها مدعي آن بودند در آن‌ها ديده نمي‌شود. آيا همه‌ي كارهاي نقاشان امريكاي لاتين در اوج دوران خود را نمي‌توان سوررئال‌تر از بسياري كارهاي سوررئال اروپايي به حساب آورد؟ اگر بناست سوررئاليسم مدعي آزادي باشد، اين آزادي در كار لاتيني‌ها به مراتب واضح‌تر ديده مي‌شود، بي‌دليل نبود كه آندره برتون نقاشي‌هاي فريدا كالو را سوررئال ديده بود، چيزي كه او خود منكرش بود. اما بي‌شك كارهاي فرناندو بوترو را مي‌توان به راحتي با مفاهيم سوررئاليست‌ها سازگار كرد. اين سازگاري همان سازگاري ابدي عنصري است كه بنا و بنياد سوررئاليسم بر آن گذارده شده، عنصري مبهم، رازآميز، هوشمندانه، سرشار از ابتكار كه برپايه‌ي جوهره‌ بنيادي هنرمند و در ارتباط مستقيم و بي‌واسطه با دنياي بيروني شكل گرفته، از اين ديدگاه سوررئاليسم دريچه‌اي باز كرده تا آنچه را كه دالي و ماگريت نتوانستند به انجام برسانند-دست‌يابي به آن عنصر سرزنده‌اي كه در شعر سوررئال مي‌بينيم-در دنياي امروز به انجام برسد. عنصري كه در آن تصوير بتواند همپاي زبان حركت كند، و سلطه‌ي خود را با روشي هوشمندانه‌تر درهم بشكند، تصويري كه بر ذهن آوار نمي‌شود و وجودش به شكلي بي‌واسطه خود زندگي‌ است. جولی تیمر Julie Taymorکارگردان فیلم فریدا در مصاحبه با Reel.com درباره‌ي نقاش چپ‌گراي مكزيكي فريدا كالو Frida Kahlo چنین می گوید: "برایم اصلا مهم نیست که شما در‌باره ی فریدا کالو زياد می دانید؛ در واقع آنها که چیزی نمی دانند زمان خوشی را خواهند گذراند، چون فیلم در باره ی زنی عجیب و غریب و غیر عادی است." موضوع بر سر آن نیست که تماشاگر هنگام ورود به سينما چیزی در باره‌ی او می‌دانسته یا خیر، بلکه بر سر این است که هنگام ترک آن چه حقایقی را در ذهن به همراه خواهد برد. گزارش سرسری ، و قابل پیش بینی تیمر از رابطه ی میان کالو و هنرمند مکزیکی دیه گو ریورا Diego Rivera چیز زیادی به فهم بیننده اضافه نمی کند؛ فردی که زندگیش با بسیاری از مباحث اساسی قرن بیستم همچون انقلابیون مکزیک و روس، تروتسکیسم و استالینیسم، سوسیالیسم و هنر پیوند خورده است. فیلم تیمر بر اساس بیوگرافی نوشته ی هایدن هِررا Hayden Herrera در سال 1983 استوار است. بیوگرافی به این توفیق دست یافت که کالو را به عنوان سرمايه‌اي به دست فمینیست‌ها بسپارد تا از او يك تمثال بسازند. زياد تعجب‌آور نيست كه تیمر (تیتوس، 1999 ) کاری برای برگرداندن چنین تصور ناسالمی صورت نمی دهد. منتقدی به درستی و تیزبینانه فیلم را چنین توصیف می کند: " عاشقانه‌ای است درباره‌ی کمونیست‌های فريبكار، نقاشان دیوارگر اسرارآميز و روابط عاشقانه‌ي لزبين‌ها." فيلم فریدا بر رابطه ی میان کالو (سلما هایک Salma Hayek) و ریورا (آلفرد مولینا Alfred Molina) متمرکز شده است. فیلم از سال 1922 شروع می کند، هنگامی که دختر مدرسه‌ای 15 ساله‌، ریورای مشهور را براي اولين بار در حال انجام یک نقاشی دیواری در مدرسه ی مقدماتی ملی در مکزیکوسیتی می نگرد. در این زمان ریورا با زن دوم خود لوپه مارین Lupe Marin (والریا گولینا Valeria Golina) به سر می برد. فریدا در سن 18 سالگی قربانی تصادف دهشتناک با وانت‌باری شد که او را برای بقیه ی عمر، لنگ و ناتوان از درد بر جای گذاشت. او خود ماجرا را اين‌طور شرح می دهد: "دسته ی صندلی مثل شمشیری که به گاو می زنند در من فرو رفت." سه سال بعد از تصادف او دوباره ریورا را ملاقات می کند. ریورا که 20 سال از او مسن تر است در حال نقاشی روی دیوار ساختمان وزارت آموزش است. فریدا برای پرسیدن نظر ریورا در باره ی هنرش به سراغ او مي‌رود و می گوید: "من نقد یک مرد کارآزموده را می خواهم. من نه عاشق هنرم و نه یک آماتور. تنها يك دختر هستم که برای زندگیش باید کار کند." اولین برخورد یکی از قوی ترین و حقیقی ترین لحظات فیلم است. در 1929 این زوج در محله ی کوآیاکان در جنوب مکزیکو سیتی با هم ازدواج می کنند، آنگاه است که فریدای معصوم تا حدي به عادت زن‌بازي ریورا پی می برد. او چنین توضیح می دهد: "من در زندگی متحمل دو تصادف شدم. یکی ماشینی که توی خیابان مرا زد، و دومی دیه گو بود." فیلم به تاریخچه اقامت موقت ریوراها در امریکای 31-1930 می پردازد. او و فریدا به سان فرانسیسکو، دیترویت و نیویورک سفر می کنند، جایی که ریورا مجموعه ای از نقاشي‌هاي دیواری‌اش را در معابر عمومی و ساختمان های شخصی کار می کند و درگیر ماجراهای خارج از ازدواج بسیار می شود. ("او در اين‌باره می گوید: چیز مهمی نیست. تمام حس‌اش بیشتر از یک دست فشردن ساده نیست.") به تلافی، فریدا نیز با مردان و زنان دیگر مي‌خواید. در اثنای سفر فریدا بر خلاف خواسته ی ریورا باردار می شود. او نگران توانایی فریدا در بارداری کودک است. پس از سقط جنینی ویرانگر و از دست دادن مادرش، فریدا به قصد مکزیک حرکت می کند اما هنگامي كه ریورا درگیر مبارزه با نلسون راکفلر (ادوارد نورتون) بر سر برداشتن تصویر ولادیمیر لنین از نقاشی دیواری مرکز راکفلر است كالو به نیویورک بازمی گردد. فریدا و دیه گو در 1933 به مکزیک بر می گردند و به خانه ی جدیدی نزدیک کوآیاکان Coyoacan نقل مکان می کنند جایی که فریدا پس از کشف رابطه‌ی ریورا با خواهرش کریستینا از او جدا می شود. اما هنگامی که دیه گو دارد تلاش می کند تا برای تروتسکی (با بازی جفری راش Geoffrey Rus) در مکزیک پناهندگی بگیرد، بین آنها مصالحه ای صورت می گیرد. در ژانویه 1937 تروتسکی و همسرش ناتالیا به خانه‌ی پدر و مادر فریدا می روند، خانه ای که با محافظین مسلح، مسلسل، آشیانه های تفنگ و پنجره های آجرگرفته تجهیز شده است. ریوراها به همراه آندره برتون شاعر و منتقد به اتفاق تروتسکی، گپ زنان درباره ی سیاست و فرهنگ، از ویرانه های تئوتی هوآکان بازدید می کنند. در گفتگوی آنان به شکلی مبهم به مبارزه سیاسی میان تروتسکی و استالین اشاره می شود. تروتسکی و فریدا پیش از نخستین سوقصد به جان تروتسکی در 1940 ملاقاتي عاشقانه با هم دارند. از عوامل استالينيست ترور تروتسكي در اگوست 1940 خبري نيست جز آن‌که فریدا مختصرا به جاسوسی متهم می شود. 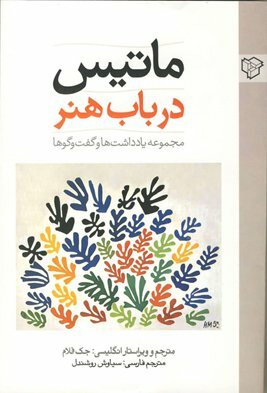 در این زمان دیه گو از او جدا شده و سلامتی‌اش به طور جدی در خطر است. دیه گو و فریدا دوباره در سال 1940 ازدواج می کنند. فریدا برای نه ماه در 1950 بستری می شود و در 1953 پزشکان مجبور به قطع پای راستش می شوند. او با وجود همه ی آسیب های جسمی‌اش به دکتر ها می گوید: "فقط جمع و جورم کنید، تا بتوانم نقاشی کنم." فریدا در 13 جولای 1954، درست یک هفته بعد از سالروز تولد 47 سالگیش می میرد. گذشته از چارچوب زندگینامه‌ی فریدا کالو که درآن از تحلیل تاریخی، سیاسی و هنری پرهیز شده، کارگردان فيلم، تيمر، نمک و فلفل کار را با برخي شگرد‌هاي گرافيكي و عروسكي اضافه کرده است. شروع و خاتمه ی فیلم پیوند سوررئال رنگهای هنرمند با مناظر حیات خانه‌ی اوست. جایی که در آن میمون‌ها و طوطی‌های جادویی میان گلهای کاکتوس در گشت وگذارند. استفاده‌ی استادانه از جلوه های ویژه به خصوص در سکانس پر تحرکی است که در آن سفیر مرگ در بیمارستان با کالوی در حال احتضار پس از تصادفش گفتگو می کند. نقاشی ها در میانه‌ی هیاهو به "زمان واقعی" بر می‌گردند. خودنگاره‌ی مشهور کالو با جنین با شگردی گرافیکی از بیچارگی و درد و رنج ناشی از سقط جنینش رها می شود. آدمها از سطح نقاشی حیاتی سه بعدی می یابند. در نیویورک، شهر احساسات فریدا، نگرانی او در باره ی ریورای زنباره در سکانسی با یک کات-آوت نمود می یابد، که در آن دیه گو- کینگ گنگ شهر را به وحشت می کشاند و بر بالای ساختمان امپایر استیت مرگش را ملاقات می کند. حتی بازی آلفرد مولینا،- یکی از دیدنی ترین چهره های فیلم - در نقش ریورا نمی تواند لغزش های بزرگ تاریخی وسیاسی فیلم را جبران کند. ریورا یکی از حامیان انقلاب مکزیک و انقلاب روسیه، و در دوره ای از عمرش تروتسکیست و همکار بین الملل چهارم بود. با وجود اینکه بسیاری از شخصیت های تاریخی در این فیلم مثل باران رژه می روند اما آنها چیزی بیش از مبلمانی شیک در فیلم به حساب نمی آیند. در کنار برتون که بسختی قابل تشخیص است، بقیه ی ستارگان درخشان این فیلم بر اساس یادداشت های تولید به فیلم ضمیمه شده اند، نقاش دیوارگر،ژان شارلوت Jean Charlot ، هنرمند نقاش، پابلو اُ هیگینزO’Higgins، سیلوستر رِوِلتاس Silvestre Revueltas آهنگساز و ادوارد وستون Edward Weston عکاس. کسی نمی تواند بشناسدشان. 'گرچه برای شناختن تینا مودوتی Tina Modotti عکاس (که معشوقش تروریست بدنام و عضو گ.پ.او، ویتوریو ویدالی Vittorio Vidali با نام مستعار کارلوس کنتراس Carlos Contreras بود.) 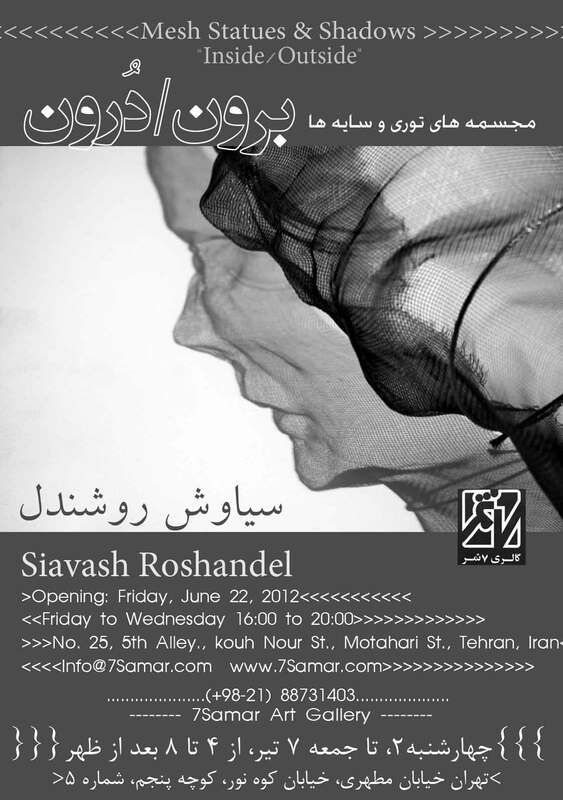 لازم نیست به یادداشت های بخش تولید مراجعه کرد؛ همینطور برای دیوید سیکِروسDavid Siqueiros ، که ارتباط این دو با گنگستریسم استالینیست‌ها هرگز در فیلم به حساب نیامده. فیلم نقش کلیدی سیکِروس را در سوقصد ناموفق به جان تروتسکی در 1940 را یا نمی‌دانسته یا نادیده گرفته است. در واقع مبارزه ی تاریخی- جهانی بین استالینیسم و تروتسکیسم که عمدتا از فیلم حذف شده، در قلب زندگی کالو و ریورا قرار داشت .این نمود، به‌ويژه در مسیر تکامل کارهای بعدی آن دو به شکلی برجسته و مستقیم رقم مي‌خورد. در 1922، سالي كه ريورا براي اولين‌ بار فريدا را به عنوان يك دختر مدرسه‌اي ملاقات كرد، او از پايه‌گذاران اتحادیه‌ی نقاشان، مجسمه سازان و گرافیست های انقلابي است. زمانی که در 1928 کالو و ریورا دوباره ملاقات می کنند، هر دوی آنان عضو حزب کمونیست مکزیک هستند. در 1929 بین ریورا و رهبران حزب کمونیست برخوردی بر سر تئوری "رئالیسم سوسیالیستی" استالین و محدودیت های تحمیلی و غیر‌قابل پذیرش آن در زمینه‌ی موضوع و سبک آثار هنری پیش می‌آید. با بالا گرفتن صدای مخالفت سیاسی ریورا و اجتناب او از کشیدن یک نقاشی دیواری به درخواست و بر اساس خط فکری رهبران حزب، او از حزب كمونيست اخراج می شود. کالو تا یک سال بعد هنوز عضوی فعال است. ایستادگی سرسختانه ی ریورا در مقابل راکفلر در نیویورک در سال 1933 ، از این باور سرچشمه می گرفت که این نقاشی دیواری با پرتره ی لنین "تنها نقاشی راست و حقیقی است که تا کنون روی دیواررفته ودقیقا بیانگر احساس جامعه زیر سلطه‌ی سرمایه داری در زمان حاضر است. این نقاشی نشانگر راهیست که انسان باید برای غلبه بر گرسنگی، ظلم ، بی عدالتی و جنگ بپیماید." در مقابل نقاشی های کالو بیان مستقیم مبارزه‌ی او با مشکلات اساسی زندگی شخصی اوست. طبق نظر ریورا، کالو "تنها نمونه ی هنرمند در تاریخ هنر است که سینه و قلبش را گشوده تا حسش را در باره ی حقایق زیستی‌ اش بیان کند." این ها کمی گزنده تر و روشن بینانه تر از تحریفات تیمرِ کارگردان است: "شخصیت دوگانه‌ی جذاب فریدا....این حقیقت که او دوجنس‌خواه بوده، این حقیقت که او زن مستقلی است که مسحور شوهرش شده است." هر دو هنرمند در صف جنبش تروتسکیستی ایستاده بودند و در دوره ای با تروتسکی در ارتباط مستقیم بودند. در 1938 ریورا در همکاري با تروتسکی و برتون در آماده کردن مانیفستِ: بسوی هنر آزاد انقلابی Manifesto: Towards a Free Revolutionary Art ، زمینه‌سازی برای هنر حقیقت‌مدار و راه‌گشایی بر "تجدید ساختار کامل و رادیکال جامعه" بود. به نظر می رسد این شیوه‌ی بی خطرتری است که ریورا و کالو ابتدا به شكل هنرمندانی مطرح تلقی شوند، نه متفکرین سیاسی‌ای که ماهیت مبارزه‌ی تروتسکی با بوروکراسی استالین و همراه با آن تئوری انقلاب پیگیر او را درک کرده بودند، تا اینکه تحت تاثیر ناسیونالیسم مکزیکی در این یا آن حوزه باقی ماندند. مسئله این است، نه آنچه که بین تروتسکی و کالو اتفاق افتاده یا نیفتاده بوده. چیزی که امروز به سبکی سخیف بوسيله‌ي تیمر و سابقا در اردوی استالینیسم پیش کشیده و تمام شده است. پیش فرض فیلم در باره ی زن‌بارگی ریورا یا "دوجنس‌خواهي" کالو نوعي انطباق با فضای روشنفکری حاضر است. در بهترين حالت نزد آنان، هنرمند ترجيحا بر دست انداختن يا تاييد رسم ازدواج متمركز شده، نه بر انهدام ساختارهاي سرمايه‌داري. سابقا فیلمسازها ارتباط هنر و سیاست را محور قرار می دادند و روابط انسانی در کار آنها تحت تاثیر تکانه های بزرگ تاریخی قرار می گرفت. کالو، ریورا را بدین شکل توصیف کرده: "آرشیتکت در نقاشی اش، در فراگرد تفکرش، و در آرزو و اشتیاقش برای ساختن جامعه ای بهنجار، یکپارچه و نیرومند، و هماهنگ.... او هر لحظه با غلبه‌ی ترس و جهل بر آدمی در ستیز است." در مقابل، ریورا در آخرین روزهای کالو او را چنین یافته: "این تراژدی نیست که بر کار فریدا حاکم است.... تیرگی درد او تنها پس زمینه‌ای نرم و ملایم برای شعله‌ی روشن و پرشور قدرت جسمی اوست، حساسیت لطیف‌اش، خرد درخشان‌اش، و قدرت شکست ناپذیراش در مبارزه برای زندگی تا به همنوعانش نشان دهد که چه‌سان مي‌توان در برابر نیروهای شر استقامت کرد و پیروز آمد." اگر چه فیلم فريدا چهره‌ای غیر جدی از تروتسکی ساخته، اما او را سزاوار آخرین کلام با یکی از شخصیت های مرکزی فیلم دانسته: "می خواهی بهار پنهان انقلاب سوسیالیستی را بنگری؟ به فرسک‌های ریورا نگاه کن. خواستار آنی تا بدانی هنر انقلابی شبیه به چیست؟ به فرسک‌های ریورا بنگر. کمی نزدیك‌تر بیا و خش و خراش‌های خرابکار‌ها را نگاه کن: کاتولیک‌ها و بقیه‌ی مرتجعین، و به همراهشان، البته استالینیست‌ها. این خط و خراش‌ها شاید جان تازه‌اي به فرسک‌ها بخشیده. در مقابل تو، تنها نقاشیِ ساده ، سوژه ای برای تفکرات زیباشناسانه نیست ، بلکه پاره ای زنده از ستیز طبقاتی، و همزمان، يك شاهکار قراردارد. اين شعري است كه در برگ آخر بروشور نمايشگاه آورده‌ام. ده سال پيش از اين يك شعر ديگر را روي كارت نمايشگاه ديگري كه در گالري دريابيگي برگزار شد چاپ كردم، و اين دومين باري است كه شعرم معرض ديد عموم قرار مي‌گيرد. روي آن كارت فقط متن چاپ شده بود و تصويري در آن نبود. به هر حال نمي‌دانم چرا اين شعر را روي بروشوري كه پر از تصوير است چاپ كردم؛ مي‌دانم كه دنياي تصوير و نوشته بسيار جدا از هم هستند و تصويري كه نياز به توضيح داشته باشد دورانداختني است، اما اين شعر توضيح تصاوير نيست شايد توضيحي باشد بر فضايي حاكم بر زندگي اين سال‌هايم، و شايد براي آن‌ها كه همه‌ي كارهاي نمايشگاه را نمي‌بينند. از همه‌ي عزيزاني كه علاقه‌مند به كارهاي من هستند دعوت مي‌كنم از نمايشگاه نقاشي و طراحي‌ام بازديد كنند. كارهايي كه به نمايش گذاشته مي‌شود شامل حدود 80 كار طراحي است كه بخشي مربوط به چهار سال اخير است و تعدادي هم از كارهاي قديمي است كه تا حال نمايش نداده‌ام و فكر مي‌كردم كه بودن‌شان به درك مسيري كه به كارهاي جديد منجر شده كمك خواهد كرد. نقاشي‌ها تعدادشان حدود بيست‌ تا است، و آن‌ها هم تقريبا همين وضعيت را دارند. دوست داشتم اين نمايشگاه به شكل مروري بر كارهايم باشد و تعداد بيشتري از كارهاي قديمي را بگذارم، اما متاسفانه جاي گالري كوچك است و فعلا امكان چنين كاري نيست. موضوعي كه در اين بيست سال كاري نقاشي هميشه آزارم داده اين است كه در هر نمايشگاه بخشي از بهترين كارها به فروش مي‌رسد، اين درحالي است كه معمولا آن بخش،‌ بخشي از يكي مجموعه است كه طبعا به اين ترتيب امكان جمع‌آوري دوباره‌ي آن نيست. خب،‌ در صورتي‌كه آن مجموعه "واقعا" ديده مي‌شد و به نقد كشيده مي‌شد، يا آن كارها در يك كتاب به چاپ مي‌رسيد مشكلي نبود، اما متاسفانه در اين بيست سال، نقد تعطيل بوده، و امكان چاپ كارها هم براي من وجود نداشته. شايد در دويست سال آينده وضع كمي تغيير كند. ممنون خواهم شد اگر لينك اين صفحه را در صفحات خود بگذاريد و براي دوستان ديگرتان بفرستيد. موضوع زن و مرد در نقاشي دنيا يكي از آشناترين موضوعات است، در نقاشي كلاسيك غرب به واسطه‌ي سنت مذهبي شديد و تكرار مداومِ اين سوژه، نقاشي يك زوج در طبيعت هميشه حضور آدم و حوا در بهشت را تداعي مي‌كند، بهشتي كه در فضايش همواره حسي از گناه، وحشت و نا امني موج مي‌زند. اما تابلوي رضا عباسي از خاستگاهي متفاوت برخاسته و احساساتي كاملا متفاوت را القا مي‌كند. حسي كه از تابلو بر مي‌خيزد، عشق، محبت، امنيت، صلح، آرامش و آزادي است. از اين بابت اين تابلو شاهكاري‌ است كه به دنياي امروز بسيار نزديك است. امضاي تابلوي رضا عباسي كه به دقت و با خط شكسته نوشته شده، روز سه‌شنبه، هشتم ماه شوال 1039 را نشان مي‌دهد. ارزش‌هاي فراواني در اين تابلو هست كه همواره مرا به وجد آورده. حدود بيست سال است كه اين تابلو را نگاه مي‌كنم، هر بار آن را زيباتر و پرمعناتر يافته‌ام و بايد اعتراف كنم كه بسيار از آن آموخته‌ام. دوست داشتم با اين تجزيه و تحليل ديگران را نيز در برداشت و تجربه‌ي خود شريك كنم. با توجه به پيچيدگي و مشكل بودن موضوع نقاش بايد به مسائل و مشكلات زيادي در كارش توجه مي‌كرده، اما او با اتكا به نبوغ و درايت‌اش به خوبي از پس مشكلات كار برآمده است. مهارت فني شايد در اين كار آخرين چيزي است كه با آن روبرو هستيم و من نيز بر آن تاكيدي نخواهم كرد، هر چند كار از اين بابت نيز بي‌نقص است. اما مهمترين و غالب‌ترين وجه كار وحدت مادي و معنوي در ميان عناصر كمپوزيسيون او است، به شكلي كه بيان محتواي ذهني و حسي او از عشق را امكان پذير كند. و اين نقطه‌ايست كه كار را با ديگر كارهاي معاصر و حتي پس از خود متفاوت مي‌كند. به نظر من اين فرم بيش از هر چيز براي اين انتخاب شده كه نقاش توانسته با آن صورت‌هاي مرد و زن را با ارزشي برابر و از روبرو نقاشي كند. اگر قرار بود سر دو نفر به طرف هم باشد، هيچ چاره اي نبود مگر آن‌كه آن‌ها را نيم رخ كار كند. در عين حال اين مشكل ايجاد مي‌شد كه نگاه دو صورت در برابر هم يك مركزيت بسيار قوي در همان محدوده ايجاد مي‌كرد كه جبرانش در كمپوزيسيون تقريبا ناممكن بود. در اين حالت كه در نقاشي مي‌بينيم نگاه‌ها به بيرون از تابلو هدايت شده و حسي از آزادي را بر‌مي‌انگيزد. احساس ديگري نيز كه اين حالت ايجاد مي‌كند اين است كه از بعد معنوي، عشق دو عاشق را در خود محصور نكرده، بلكه نگاه و حركت آن‌ها به سوي بيرون از خود است. در اين حالت است كه مي‌توان انقلاب دروني‌اي را كه عشق در عشاق برمي‌انگيزد و آن‌ها را به دنيا پيوند مي‌زند حس كرد. انجير‌ها و شراب بعد مادي و جسماني ارتباط را تشديد كرده‌اند، و قرار گرفتن دو عاشق در فضاي بيرون و طبيعت احساس دلپذيري از پيوستگي انسان و عشق با زمين ايجاد مي‌كند. اينجا زمينِ مادر به بهشت بدل شده، و انسان با حضور عاشقانه‌اش آن را تكميل كرد‌ه است. در رابطه با ايجاد وحدت و پيوستگي معنوي بين دو عاشق، يكي ديگر از جالب‌ترين نكات اين كمپوزيسيون در سادگي برخورد با طبيعت است، به جز گل نرگس و دو ميوه‌ي قرمز رنگ، طبيعت اطراف تنها با رنگ طلايي و با ساده‌ترين شكل تصوير شده، اين امر به تمركز بر سوژه‌ي انساني كمك مي‌كند. همچنين رنگ آسمان از رنگ زمين تفكيك نشده، تنها چيزي كه به آسمان اشاره دارد قلم‌گيري ساده‌اي براي ابر‌هاست. براي تفكيك آسمان و زمين نيز حتي خطي در نظر گرفته نشده، و اين موضوع وحدت بين زن و مرد را از بعدي ديگر كامل كرده است. تنها حضور ابرها و حركت درخت است كه به حضور آسمان اشاره دارد. كوچكترين اشاره به خط افق يا تفكيك رنگ آسمان و زمين اين وحدت را سريعا نابود مي‌كرد. اين امر نيز يكي ديگر از كليد‌هاي كمپوزيسيون بي‌نظير رضا عباسي است. دست‌ها نيز در اين نقاشي بسيار زيبا كار شده‌اند، حركت كلي دست در مينياتور و هماهنگي اين حركت چيزي است كه هر نقاش مدرني را نيز مجذوب مي‌كند. حركت دست‌ها و انگشتان چنان به كمال هستند كه بهتري نقاشان امروز نيز در آرزوي آنند. نكته‌اي زيبا در حركت دست‌هاي زن هست كه به سوي سرِ مردش دست برده، اين حركت زن را از حالت انفعال به كلي خارج كرده، و بعدي ژرف به معناي تابلو در ارتباط ميان زن و مرد بخشيده، اگر اين دست و اين حركت نبود، رابطه‌ مرد و زن به سود مرد تغيير مي‌كرد. در عين‌حال حركات رو به بالاي دست‌ها،‌ خصوصا دست راست زن كه گل نرگسي نيز با خود دارد، حس رهايي و آزادي را در تابلو تشديد كرده. جالب آن‌كه موضوع عشق در اين تابلو تنها عشقي معنوي نيست، حركت اندام دو مدل و خصوصان دستي كه به نرمي بدن زن را از زير پيراهن لمس كرده كاملا گوياي جنبه‌ي جسماني عشق ميان زن و مرد است. از ديگر نكات جالب در اين كار مي‌توان به شباهت ميان زن و مرد اشاره كرد، زن و مرد در مينياتور بسيار نزديك به هم كار مي‌شوند، هم از لحاظ اندام و هم از نظر صورت، شباهت‌شان بيش از تفاوت‌شان است. اگر از بيرون به انسان نگاه شود احتمالا نتيجه‌ي كار همين خواهد بود. در اين شيوه موفقيت نقاش بسيار بسته به آن است كه بتواند تفاوت زن و مرد را جوري كار كند كه حس تصوير بتواند تفاوت ميان آن دو را القا كند. اين امر تنها با توجه به همه‌ي جوانب كمپوزيسيون ممكن است. كار كردن اندام زنانه به واسطه‌ي انحناهاي موجود در آن ساد‌ه‌تر است. اما رضا عباسي نقاشي است كه از مدل‌هاي مرد نيز نقاشي‌هاي زيادي دارد و معروف است كه زيبايي مردانه را در اندام مردهاي جواني كه نقاشي كرده كشف كرده و بروز داده است. در اين تابلو نيز‌ او اين مسئله را در تركيبش به خوبي حل كرده و توانسته جنسيت مرد و زن را در علي‌رغم مشكلات سبك به خوبي به تصوير بكشد. رضا عباسي بيشتر نقاشي فرم‌گراست. 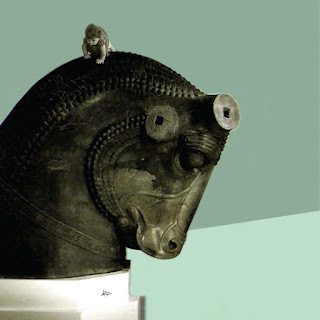 رنگ‌گرا نيست. طبعا وقتي يكي از اين عناصر در كار بر ديگري غلبه كند آن يك تضعيف خواهد شد. او كاملا آگاهانه از بكار بردن رنگ‌هاي تند در كارش پرهيز مي‌كند كه خلاف روال جاري در مينياتور دوران خود است. تضعيف رنگ به نفع فرم سنتي شناخته شده در نقاشي جهان است. كه از آب‌مركب‌ها و نقاشي‌هاي شرق دور تا دوران مدرن ادامه يافته است. پالتي كه سزان و بعدتر پيكاسو و كوبيست‌ها به كار گرفتند بسيار نزديك به پالت رضا عباسي در اين تابلو است. نقاشي‌هاي رضا عباسي در اروپا كاملا شناخته شده بود. و شكي نيست كه بر نقاشي مدرن دنيا تاثير زيادي گذاشته است. نكته‌اي بسيار مهم در اين تصوير هست كه نبايد از خاطر برد. مينياتور ايراني اساسا در ارتباط با روايت، داستان و شعر كار شده است. اين تصوير از اولين تصاوير و استثنايي بر اين جريان عمده‌ي حاكم است. تصوير حاضر براي هيچ داستان و روايتي كشيده نشده، بلكه قائم به ذات خود است و نقاش توانسته برداشت شخصي‌اش را از عشق ارائه كند. بنابر اين مي‌تواند به عنوان نقطه‌ي عطفي در مينياتور و نقاشي ايران به سوي رهايي از بند ادبيات محسوب شود. متاسفانه با وجود ارزش‌هاي بي‌نظيرش، سال‌‌هاست كه اين تابلو از ديد مردم مخفي مانده. تابلويي كه اگر بهترين نباشد، بي‌ترديد يكي از زيبا‌ترين كارهاي عاشقانه‌ي دنياست. نگاهش كنيد! الوار در شعرها از نقطه‌گذاري معمول استفاده نمي‌كند، من نيز به همين دليل در ترجمه، ساختار شعرها را با همان نقطه‌گذاري او حفظ كرده‌ام. اين كار متن را شبيه به شعر‌هاي قديم فارسي مي‌كند كه بايد از روي معني شعر خواندنش را پي گرفت و براي خواننده‌ي فارسي دور از ذهن نيست. رفتم كنسرت. كار اين دو نوازنده را تا حال نشنيده بودم. شنيدم، عالي بود. در بهترين كيفيتي كه مي‌توان تصور كرد. در بروشور كنسرت در مورد ليلي افشار به جوايز بي‌شمار و بزرگ جهاني او اشاره شده كه در اين سايت به‌طور كامل زندگي و كار او هست. همين بس كه او نوازنده‌ي مستر كلاس‌هاي آندرس سگوويا (بنيانگذار گيتار كلاسيك نوين) در دانشگاه كاليفرنياي جنوبي بوده و در همان زمان سگوويا در مورد او چنين گفته: "او بي‌شك يكي از مشاهير گيتار كلاسيك در جهان خواهد شد." موسيقي زنده اين لطف را دارد كه انسان از حضور هنرمند نيز بهره‌مند مي‌شود. از آن‌جا كه هميشه عكس‌ها دروغ مي‌گويند، ليلي افشار نيز موجودي كاملا متفاوت با عكس‌هايش است. ديدن نوازندگي ليلي افشار با آن دست‌ها و چهره‌ي ظريف و پر احساس از خاطرم محو نخواهد شد. فروغ كريمي نوازنده‌اي بسيار چيره‌ دست است، كه در سطح جهاني كار كرده و برنده‌ي جوايز متعدد شده از جمله Wanas-Stiffung de wiener Philharmoniker . او از سال 1370 تا امروز مدرس مدرسه‌ي عالي موسيقي وين (دانشگاه موسيقي فعلي) است. و خيلي چيز‌هاي ديگر درباره‌ي او گفتني است. اما حضور او روي صحنه آرامش و ارتباط زيبايي كه حركاتش با موسيقي داشت مثال زدني است. تسلط بي‌نظير او بر سازي بادي كه از مشكل‌ترين ساز‌هاي دنياست و نفس و دم گرمش را تحسين مي‌كنم. و از هر دوي اين عزيزان متشكرم كه فرصتي فراهم آوردند تا به نواي دل‌انگيز و سازشان گوش كنم. فضاي تالار رودكي را مدتها بود كه نديده بودم. متاسفانه فضاي زيبايي نيست. آثار بي‌توجهي، در همه‌جاي سالن به چشم مي‌خورد. بسياري از صندلي‌ها شكسته بود و من نمي‌فهمم كه چرا اقدامي براي تعمير آن‌ها نمي‌شود. فضاي پشت سر نوازندگان نيز پر از اشياء نامربوط با كنسرت بود. در واقع از آن فضا به عنوان نوعي انباري استفاده شده بود. صحنه فاقد طراحي و نورپردازي بود. بروشور كنسرت در ساده‌ترين شكل و كاملا غير حرفه‌اي، به شكل فتوكپي چاپ شده بود. تبليغات كنسرت نيز بسيار محدود بود، ظاهرا روزنامه‌ها، راديو، تلويزيون و اينترنت جاي اين كار هستند؟؟؟!! اين مسائل شايد وضعيت موسيقي ما را روشن كند. و اين‌كه كنسرتي با اين كيفيت چرا بايد فقط دو شب اجرا شود. فروغ كريمي نيز در اين مقاله به وضعيت نامطلوب كارگزاران موسيقي اشاره كرده، بخوانيد! اصل كتاب سه رساله درباره‌ي خوشنويسي است: سراط‌السطور سلطانعلي مشهدي، مدادالخطوط ميرعلي هروي و آداب‌المشق ميرعماد. هر سه مقاله از لحاظ تئوريك بسيار قابل توجه‌اند و گنجينه‌اي از دانش تئوريك هنر تجسمي در آن‌ها نهفته است. اين نكته آن‌جا ارزش بيشتري پيدا مي‌كند كه درباره‌ي نقاشي اثري با اين دقت نوشته نشده، يا حد‌اقل من نديده‌ام. به اين ترتيب مي‌توان با قياس از نوشته‌هاي خوشنويس‌ها به اين نتيجه رسيد كه براي نقاشي‌ و معماري نيز تئوري‌هايي به همين دقت وجود داشته كه متاسفانه مدون نشده‌اند. علاوه ‌بر آن خطوط بسيار جالبي نيز در كتاب به چاپ رسيده، كه علي‌رغم افت كيفيت در چاپ روي كاغذ معمولي هنوز قابل استفاده‌اند. اين شيوه‌ي چاپ نيز با توجه به قيمت كتاب كاملا توجيه پذير است، مسلما مي‌شد كار را به سبك امروز، روي كاغذ رنگي گلاسه چاپ كرد تا "شيك" شود، اما در آن صورت قيمتش سر به جهنم مي‌زد. به نظر مي‌رسد كه مي‌شد نظم بهتري در طبقه‌بندي خطوط اعمال كرد. اما در مجموع به نظر من كتاب از همه نظر جالب توجه است. چه شكل و چه محتوي. و ايكاش كه همه‌ي منابع تصويري، خطوط و نقاشي‌ها با همين شيوه و به قيمت ارزان در اختيار علاقه‌مندان قرار مي‌گرفت. "خداوندا پوشيده نماند كه بندگان سيد نجم‌الدين عودي و شاه درويش نائي و شهاب دم‌كش و حافظ صابرقاق با خدام مخدوم‌زادگي استاد مولانا حاجب مصنف و بناب خواجه شاديشاه و اخوي مولانا يقيني و اخوت پناه مولانا غياث‌الدين‌مذهب و خواجه عبدالله قاطع‌ ماه‌پاره‌ي مجلد و سيد‌بابا افشانگر و شكري چارتاري، و از مقبولان ايثار‌بيك نيي؛ و از وزيران،؛ خواجه ايغور و اميرزادگي قاسم‌بيك برلاس و طوفان‌بيك و بهادرخان سلطان خان جلاير، و از محبوبان حورنژاد، شاه خانم مهرطلعت و شاه نواز خاتون نغمه‌سراي و از قواماي صاحب صوت و ديگر خوانندگان، در باغچه‌ي نورا، طبخي در ميان دارند و انتظار مقدم شريف مي‌‌كشند لطف فرموده توجه فرمايند." "بعد از رقم، بندگان سيادت‌پناه امير‌شيخم سهيلي و جناب امير‌‌ملك جويني و خورشيد خانم بزم‌آرا تشريف آوردند. حاصل كه ملك بر فلك رشك دارد. عبدكم سلطانعلي."